Will an adventurous octopus ever find a friend? Follow the lonely Monsieur Pierre Poulpe from his home in a Paris fountain all the way to California. 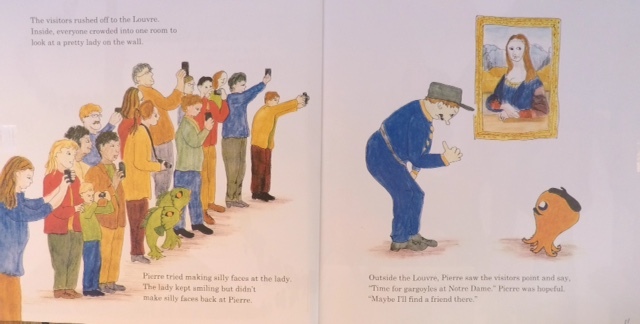 Humorous illustrations chart his search for a friend across the Seine, up the Eiffel Tower, into the Louvre, out to Notre Dame and up Montmartre. Along the way, he surprises some of the most famous inhabitants of the City of Light. Sadly, none of them are eager to befriend a little octopus. Just when it seems all is lost, Pierre has a clever idea that takes him to a new land with two new friends. In a surprise ending, Pierre and his new friends are visited in his new home by some of the famous Parisians he left behind. Monsieur Pierre is available from Amazon.com or by special order at your local bookstore. Monsieur Pierre is distributed in the U.S. by Ingram. Author Anne Dana lives and draws on a motor yacht on the San Francisco Bay in the picturesque town of Sausalito, California. She has always been fascinated with octopuses; those masters of escape and camouflage, quick learners and problem solvers. While on vacation in Paris, she came across a little hand knitted octopus in a children’s store. That little octopus came home to California and the idea for Monsieur Pierre was born. She is a member of the Society of Children’s Book Writers and Illustrators. ©L O Annie Press, 2019. All rights reserved.